A million bucks buys you a lot of things. In the car market, it allows you to choose between the number one hatchback, a brand new sedan, and a couple of very appealing compact SUVs. So, which would you choose? When I say one million, any man with the slightest understanding of the term ‘sanity’ would instantly imagine that to be quite a big number. But that’s the typical average-income man. For rich chaps like larger-than-life sportsmen, highly-placed politicians, uncouth businessmen, big film stars, or paid assassins – who are all strangely interconnected somehow or the other – that’s an amount they’d consider small change when compared to their total amassed wealth. One million may buy them a Patek Philippe watch, or a Mouawad accessory, or perhaps some Stuart Weitzman-designed jeweled-footwear for the mistress. One million for India’s informed, price-conscious, and extremely smart middle class, on the other hand, is the price of a reasonably big car. So,when Ford decided to launch its much-talked-about EcoSport with an under-6-lakh starting price, it seemed tastefully done – and Ford had the whole nation talking about the car. Twitter was working overtime, and the various EcoSport hash-tags were at the top of the trends, and the entire bag of new-age and conventional news sources were churning out many stories. Ford must have been very happy indeed! So-much-so that they even sent out press releases stating that there have been over 30,000 bookings for the EcoSport in just 17 days – mind you, that’s only bookings. But I’m drifting towards market analysis, and I shall reserve that for another time. So, the EcoSport’s been a sure-shot firecracker for Ford, much like the Figo – and the competition must be really worried. The EcoSport is so well placed in the market on the price parameter that it fights not just its primary rival – the Renault Duster – but also declares war against a bunch of hatchbacks and the best-selling compact sedans. So we had a brainwave – get the best of each body-type and see what’s what. Er, okay, plainly that’s not really a ‘brainwave,’ but it’s a good idea all the same. So, here you see the i20 representing the hatch segment because it’s one of the best-equipped and most stylish cars around – most sedans are much less equipped at the same price. The Honda Amaze is the natural choice to stand tall as the entry-level sedan, and then, of course, is the Renault Duster – the one car Ford has to beat! The i20 has gradually become the darling hatchback of the nation – a couple of months back, it even sold more than the i10. The i20 has a very grown-up appeal to it. If you buy one, you’ll be looked upon as a guy who understands technology. It’s so well thought-out on the inside, and there are so many things you get if you choose the higher trims that you do really begin to make sense of the almost-9-lakh-rupee cheque that you just wrote for it. The i20 offers parking sensors, a reversing camera, adjustable seats, automatic wipers, electrically folding wing mirrors, banging audio unit, a dial to control the luminosity of interior lighting, steering-mounted controls, climate control, and a cool box – small things, but they do make you feel a notch smarter than your neighbour who just bought himself a Swift. The i20 is much more stylish too. And while you may argue in favour of the Swift being more fun to drive, let me ask you this – do we have the luxury of wide open and winding roads to really test the limits of our cars? Or do you head 400 kilometers North to find a great piece of road every weekend? I rest my case. But that doesn’t take away from the Swift’s credentials, and I agree that it’s more dynamically sorted. But the i20 has a very persuasive weapon – an 89bhp, 1.4-litre diesel engine. We love that engine so much that we’d take it home if it were a woman. The power is impressive, and the delivery of it even more so. You can run this car in 3rd all day long, and you still won’t be visiting the fuel station for days. Oh, and you’ll be smoking more expensive sedans at the traffic signals too, if you so wished. Hyundai hasn’t been the by-word for driving dynamics though, and that shows in the i20. It’s not a particularly good handling car. It dives under hard braking, the steering feels clueless about its job when pushing the car around bends, and there’s an enhanced sense of body-roll too. So, obviously, it’s not the one you’d take to the racetrack – but we did, and it beat all the other small cars out there! But that’s again due to the great speeds that this diesel motor can achieve without breaking a sweat. The i20 is the most premium, premium hatchback – and it feels such. Plus it’s got a lovely engine. I’m not saying a word more now. You look at the Honda Amaze, and wonder why it’s here, considering that I wrote previously that the Dzire feels more fun to drive. But the Amaze is a more rounded car, and is just a better overall package. Plus, Honda has come the closest to Ford on one very important parameter– creating a buzz in the market. The Amaze is Honda’s first diesel product in India, and with the rapid shift towards diesel fuel in our country over the last 2-3 years, it’s been a shot in the arm for the Japanese company – which was once a mighty force in India. So, what makes the Amaze click so well? First – it’s a Honda, so the brand equity it enjoys is beyond compare, and the product certainly builds on this. Yes, I’ve said time-and-time-again that the NVH levels could be better, and that it should have a broader operating power-band, but that said virtually everything else about the Amaze is bang-on. It’s the first serious rival to Maruti’s Dzire, and looks so much better in comparison – it’s like comparing Rosie O’Donnell and Jessica Alba. The Amaze has most of the best cards in a game of top trumps, and it plays them one at a time. The diesel engine is the main highlight, and though it feels the happiest between 2500-4500rpm, this diesel motor begs for more revs at the top end. The space inside, and the driving characteristics also get a thumbs-up – but the Amaze could do with a few additions on the equipment list though. It comes with all the necessary evils, but fails to spoil you like the i20 does. We’re Indians, we like more stuff in everything – even our Subway footlongs! Give us some more items like Bluetooth and we’ll happily take it, Honda. Just don’t increase the price while you’re at it, though. The Amaze is a happy car – it feels fresh, and the striking similarity to the City from some angles isn’t a bad thing at all. The steering is direct, though slightly lacking in feel, and the handling is taut while the body-roll is well contained. In a word – it’s rather lovely. The Duster has been an autoX favourite in more ways than one. We’ve gone beyond having just tested it as journos, we’ve even lived with it for several months – and it’s never ceased to amaze us (no, that’s not a wisecrack against the Honda). The Duster feels solidly built and extremely well put-together. During the media drive of the car, everyone was rather disappointed by the look-and-feel of the plastics, but after using it and driving it hard over all sorts of terrain, the interior hasn’t developed a single squeak. So, it may look stupid and cheap, but it’s actually quite well built. If I can be critical towards the Duster, it’s because it’s got one big problem – the steering kickback is so severe that it can cause the steering to be snatched from your hands if you’re pushing it over some rough patches in the hills. The Duster is a fairly straightforward vehicle – the engine pulls neatly, and though the 110bhp tune is decidedly faster, the 85bhp variant that fits this price band actually drives better in the city. It’s got a more linear torque spread, and a lot of it comes from very low in the rpm band. Plus, the clutch is light, so your calf muscles don’t suffer like they do in the 110bhp version. The ride and handling have always earned the Duster brownie points, and it’s one of the most sorted and accomplished mainstream automotive packages that we’ve sampled in some time. Off late, it’s been my preferred choice for long-distance touring. 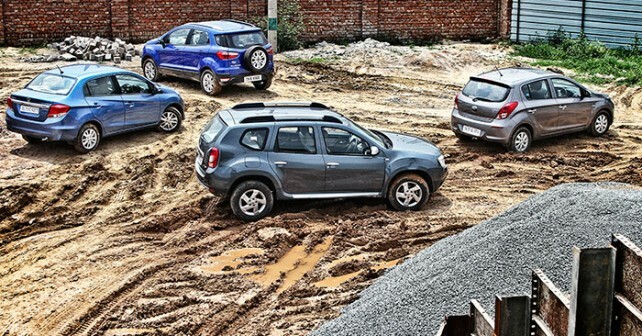 The Duster surprises you with the way it drives – surprises you in a pleasant way that is! When Ford introduced the Figo, the news spread like wildfire, and it was a good number-churning car for them – that’s because they played the price game very smartly. And it’s a brilliant little hatch to drive. Give it a nice revvy 1.6-litre engine with 120bhp, and it’ll rip the Polo TSI apart – it can be that good. But you can’t win the war with just one skilled swordsman, can you? Another product was needed, and with the compact SUV segment getting increasingly popular with Indian consumers, Ford has fired with all guns blazing. The EcoSport makes for a very visually arresting car – the front is dynamic and aggressive, while the rear tries its best to add some macho appeal to the EcoSport with the spare-wheel mounted on the tailgate. But (and you did see a ‘but’ coming, didn’t you?) there’s a problem. For a start, the EcoSport doesn’t look very SUV-esque – I didn’t say it doesn’t look attractive, but just that it lacks the stance of an SUV. And while the cabin quality of the Duster looks cheap in comparison, the EcoSport looks radical with edgy interior design – and that makes it feel quite sporty. But the quality of the plastics used isn’t great, and I get a sense that the rattles will start settling in quite soon. In fact, when Ishan and Jared drove the EcoSport during its global media drive event in Goa, they did mention some rattles from the cabin being an issue. I’ll still give it the benefit of doubt as it may have been a pre-production piece, but as the quality stands in its final form, I’m not convinced just yet. So, if you’re car-hunting in the 8-10 lakh bracket, and don’t quite fancy a small car or a sedan, and are smitten by the SUV body-shape, it’s the EcoSport and the Duster. Or better yet, wait for the Nissan Terrano perhaps. Oh God, how did I get so far adrift in this report?